Constant Contact is the clear winner when it comes to list management, rate of e-mail deliverability, and customer support. 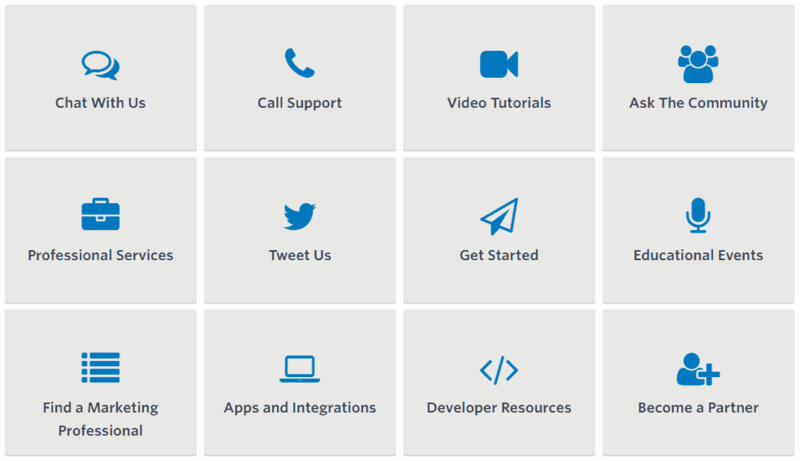 They’ve also got more options for importing contacts and a greater variety of ready-to-use e-mail templates. However, Constant Contact lacks A/B testing functionality and advanced automation features, which may be a deal breaker for professional marketers. They’re also priced a bit higher compared to other options in the market, but they do offer a 60-day free trial capped at 100 unique contacts. Constant Contact is an ideal platform to begin your email marketing campaigns, which scores high in all of our review sections. Yes, the price is slightly higher than other options on the market. However, you get access to some incredible tools and features. Whether its high quality templates, great usability or a large email subscriber list, you have the power at your finger tips. The service comes with a 30-day free trial so you have plenty of time to make yourself comfortable. Take a closer look at what Constant Contact has to offer. Constant Contact offer a full range of professional looking templates. You will have fun customizing them as you see fit. Constant Contact pride themselves on their versatile and user-friendly templates, as well as their multimedia choices. Template Selection: With over 400 professionally designed, mobile friendly templates in over a dozen categories, it’s easy to find the right match for your campaign. Customization: Save on the designer as you become an editing master! After you select your template, it’s time to make a few tweaks. Moving images and text blocks around the template is a no brainer with the Drag & Drop editing tool, so it can suite anyone, from the novice to the savvy! Multimedia: You can host up to five images at a time before Constant Contact begins charging. However, the templates come equipped with excellent, high quality photos. If having your own original images isn’t too important for you, you can template images with no extra charge. To break these limitations, you can add $5 a month and get access to thousands of photos and store up to 50MB of media. This is a great feature that comes for a very low cost, we think it’s worth the price. 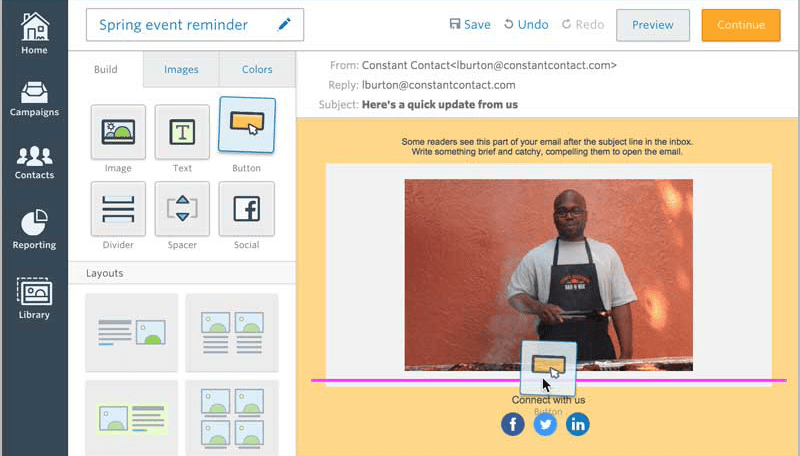 Customizable Templates: The Drag & Drop interface makes it very easy to customize the email template of your choice. Automated Emails: Allow you to send the right email at the right time, to the right person. With the auto-responder tool, you create a personalized email once, and then set it to send automatically when certain rules are met, i.e. when a new user signs up to your service, or when they’ve reached certain a milestone. Set a series of emails for your contacts and then, forget about them. As you add new contacts to your automated list, new subscribers will begin to receive a scheduled series of emails. You can easily upload your email list from Excel, Gmail, Outlook, etc. Constant Contact will take care of unsubscribes, bounced messages and inactive addresses and update them automatically. Post your emails onto your social networks with a click of a button. Constant Contact will suggest the captions and images to optimize your ads. The email tracking tools will identify who is opening, clicking and sharing your posts in real time, so you can assess your next steps. Whether you’re a skilled marketer or just starting out, Constant Contact will allow to setup your email campaigns in no time. There is no need to read through guides or watch tutorials! The user interface is so intuitive you can pick it up right from the first time. The only thing we found missing was an easier access to the pricing chart, which is somewhat hidden behind the 30-day free trial and encourages you to get started before you fully understand the long-term costs. Constant Contact offers a wealth of support options, for every phase of your email marketing projects. It starts with an extensive knowledge base with start and clear articles containing step-by-step help and tips. There is also an extensive library of how-to videos and a section of tutorials for users get getting started with Constant Contact. They also offer paid professional services for advanced or unique needs. Something unique about Constant Contact is the 30-day free trial, with unlimited emails sending to up to 100 email contacts with all features included. Once the free trial expires, you have three options for payment. All the packages are based on the size of your subscribers list and are differentiated by their length. If you are a registered non-profit organization, you can save 30% off any of the packages. All of the pricing packages are fully featured, we recommend prepaying for the 6-month plan, and adjusting your list size when necessary. When all is said and done, Constant Contact is a great way to stay connected with your subscribers. 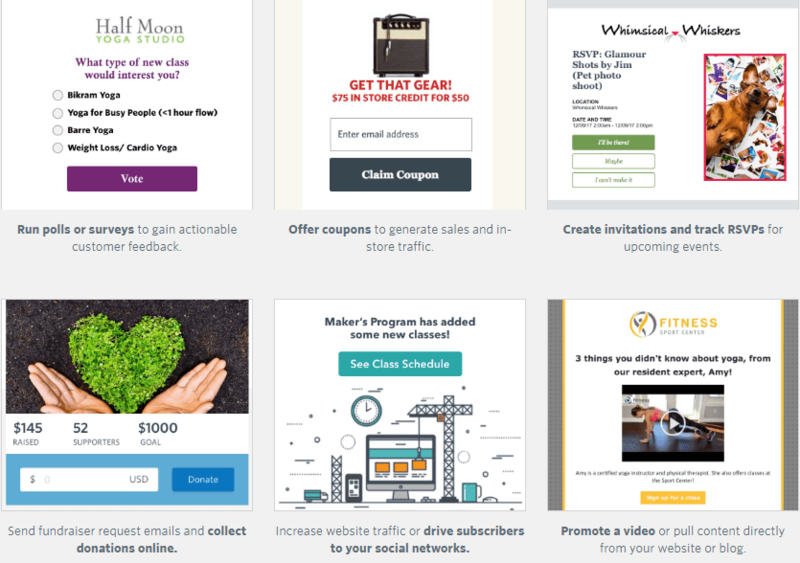 Their email marketing platform offers an excellent user interface, hundreds of high quality templates, and a very resourceful learning center.